I lead an interactive Q&A with Empire Avenue (my take here) CEO, Dups, kicking off the event, and the primary focus of the roundtable, and we discussed how the platform works, and his vision. However, we quickly invited Ali from Intel up to share his needs from a brand perspective which were to engage with customers, focusing on reach and advocacy. We explored other potential use cases involving branded goods, couponing, and use brands like Coke as examples of companies that would want to get engaged. Of course, it was important to discuss what’s in it for the users of these tools, stemming from entertainment, connecting with others, or even increasing visiblity and repuation as we heard from Chris Salazar. Dups announced that their second iteration of the API will be released in a few weeks and that Ford will be offering branded virtual goods soon on the platform. We explored head on some of the challenges and concerns, and Kristie Wells brought up requests for reputation and influence (even points and potentially badges) should be shared cross platform, but we could sense that could create business model conflict unless Badgeville or Gigya cut deals with Empire Avenue for brands like Intel to make these reputation pieces portable. I suggested that influence and repuation is already portable, even if the data is not transferrable and suggested that Scoble shifted his blog influence to Twitter, and then Twitter influence to Empire Avenue just by shifting his community. Teens in Tech founder Daniel Bru pointed out there are new startups emerging that allow for the transfer of these virtual goods, like Klip that will soon emerge. A few curious attendees indicated that they were skeptical but attended in order to learn new points of view, which we embrace. There were some vocalized concerns that if gamificaiton platforms don’t quickly shift reputation, points or badges to a transfered value like coupons, premium content, or other real world tangible ability some of these platforms would die out. One of the key findings is that the gamification of influence (like Empire Ave) isn’t for everyone, and many people are not driven by reputation and badges –they just want to connect with others and communicate. We’re in the early days, I’ve only started to hear about this space about 6 months ago from Esther Lim (she’s been on the speaking circuit on the gamification topic), although reputation features in social media have been around as early as Technorati started to track blogs. Many interactive marketers and media professionals see the opportunity for brand engagement, loyalty, and eventually advocacy, there are still a lot of questions if the investment makes sense –it’s not clear to most if it increases consideration or moves revenue needles forward. We’re already seeing brands that are already socially engaged jumping into the gamification jungle, and we’ll see experimentation in 2011 and a few case studies of success, although most experiments will not win. Expect that CPG, consumer electronics, and retail/hospitality to be the first industries to move into this space, although B2B tech has already deployed gamification for internal learning purposes, like Cisco’s sales team at sales events. We’re intrigued to the be the *first* company to have a branded good on this emerging platform, and will use this experiment to learn how other brands can apply this tactic. 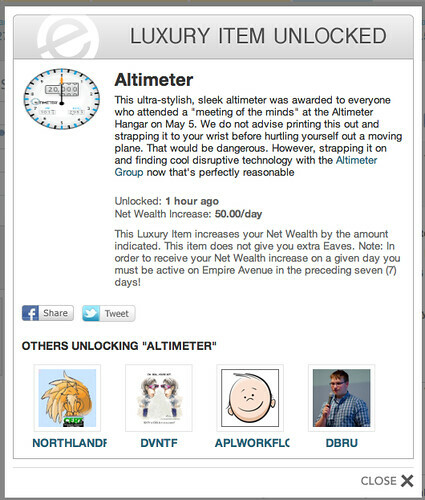 Physical attendees received the first ever branded virtual item inside of Empire Avenue, the Altimeter, which you can see on my Jowyang Empire Avenue profile, (or if you’re not on the game see this screenshot). Aside from branded affiliation the virtual Altimeter provides Net Wealth Increase of 50.00/day –adding value beyond just a badge. This was the first in our ongoing series of Roundtables, we want to sponsor community conversations to advance the industry, and our research efforts for our clients. 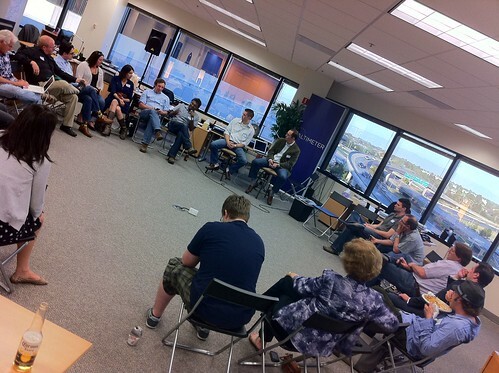 Want to attend an Altimeter Roundtable in the future? We’ll hold these every few months at our San Mateo office, The Hangar, follow our Altimeter Group Twitter account to stay informed.